For those unaware, twitter is a service/application commonly used for micro-blogging. How does this differ from blog-blogging? Well, like the name suggests, it’s shorter. Rather than long-winded entries (like this one), twitter users give short messages (limited to 140 characters) about what they are doing, thinking, observing, or anything else they’d like to share. These are called “tweets”. Tell the world what you are doing! So far, so good? Okay. Tweets can be sent to twitter from your cell phone, PDA, or non-mobile computing device in a variety of different ways. Each “tweeter” (n. one who tweets) can “follow” other tweeters, building a complex network of tweeters tweeting on twitter. Other tweeters may be your friends, politicians, celebrities, random folk, or a group of some sort (hint, hint). Tweets can be directed to an individual or the entire twitterdom. If one so wishes to follow you, they can view your tweets from http://twitter.com, or they can receive your updates as a text message on their cell phone (an opt-in service, so it’s only there if you want it to be). So what can twitter offer to the library world? Lots of libraries, universities, and corporations are already using twitter to market their services. UIUC’s Undergraduate Library operates under the name “askundergrad“, providing information about campus and library events, services, and resources. 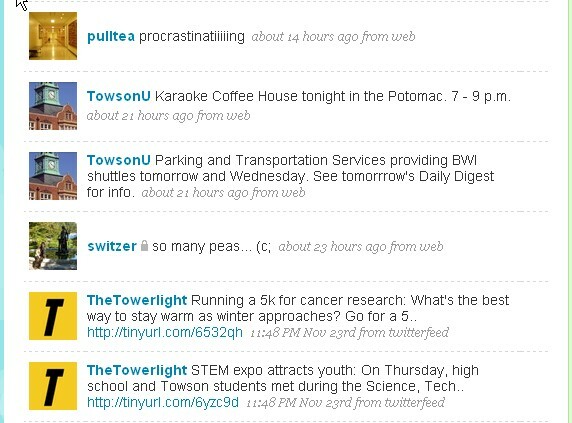 In fact, Towson University has a twitter profile and so does The Towerlight. Your tweets can also be connected to your website as I’ve done with my tweets. Twitter is just one more way to broadcast the library’s message to the world. Twitter is a pretty simple application; the real power is when you connect it with other tools, applications, and services. Also, take a look at EduCause’s “7 Things You Should Know About Twitter“. Hmm, I especially like the idea of creating a twitter account for a class… thanks for a great overview! I thought using it in the classroom might be an interesting experiment too. I haven’t seen or heard of anyone doing this yet. I need to think a bit more about how that would play out. Also, this post about twitter and the library was conveniently written yesterday as well. Cool stuff! Last week as I was considering what to post about this week I heard this NPR story. It’s about using (Twitter-like) Yammer to cut down on email in the office. Thanks for the link. There are so many things you can do with twitter. Our biggest reaction is from the new books, videos, and audio fee. When we had some new DVDs, people were asking about them through twitter before they even hit the physical shelf.